A question asked regularly at Redmond Pie Towers is how can people stream audio from a computer to an iOS (iPhone, iPad, iPod touch) device? Well today saw the launch of WiFi2HiFi from developer Clever & Son. Using the WiFi2HiFi app and Mac or Windows companion application, users can stream audio from any app over a local network to any iOS device for playback. 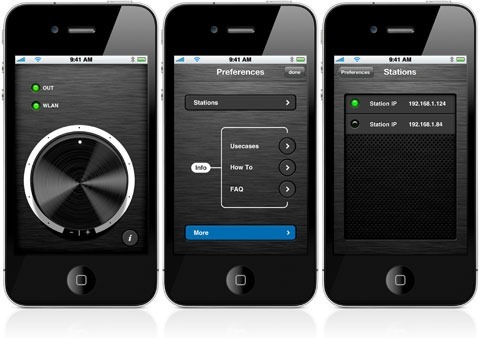 The beauty here is your iPhone, iPod touch or iPad can be used as a remote audio-system. Just connect the device to a HiFi or other audio system and away you go. No need for an expensive music-sharing system. Zurich, Switzerland – Clever & Son AG is pleased to announce that WiFi2HiFi has been approved into the App Store. It will be released on the 21st of February. WiFi2HiFi lets users stream audio from any computer program to either a stereo system or a sound-dock, with an iPhone or iPod touch acting as a wireless receiver. With WiFi2HiFi you will never be bored with the same music on your mobile device. The diverse world of music is at your disposal with the latest releases alongside your favorite music albums. All you need on your computer is the free desktop application WiFi2HiFi Station. • Any audio program from music players to streaming media can be played. • Your iPhone is automatically detected. • The music stream whether from online radio or from your hard drive can be plugged into your docking station or headphones directly while you control it with a simple click of your mouse. WiFi2HiFi will be available worldwide through the App Store. Clever & Son AG is an independent software company focusing on simple to use and high-quality mobile and desktop software applications. WiFi2HiFi is currently just $0.99 on the Apple App Store.